We are mixing things up a little bit this week, since we are travelling, so instead of our standard posts you’ll catch some reviews of things we are seeing and doing while your ranchers are on the road. 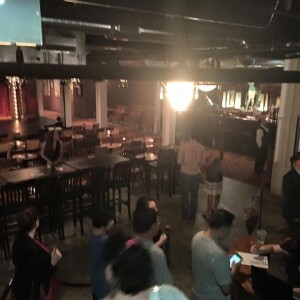 Let’s talk first about the Uptown Underground – the venue where the magic happens! It’s inside of an (architecturally very cool) building at 4700 north Broadway, just a handful of blocks south of where I used to live in Edgewater Beach. There isn’t a ton of street parking, but if you don’t mind walking a little bit you’ll find something. We searched in vain for a lot, but there didn’t seem to be one in the area that wasn’t permit-only or reserved for a business. They really should make a deal with the bank a couple of blocks over to use their lot at night – just a suggestion, guys! It’d be handy! 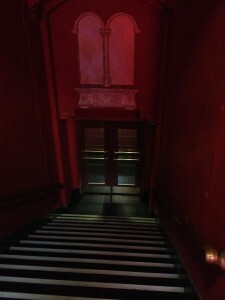 The address of the club leads you to a main doorway with buzzers set into the middle of the building; the businesses in the lower level have different addresses. We arrived a bit early and milled around there with a couple of other people who had never been there before and were equally confused; the doors were locked, the buzzers were unmarked, and we didn’t really know where to go. A bit later, a door on the northwest corner of the building opened and a gentleman in a black vest stood there, looking all official. Mysterious! It turned out to be the entrance to the basement, as Uptown Underground is, actually, underground. The place has a seriously cool vibe to it. It just screams speakeasy, which – looking at the vintage photographs adorning the walls by the bar – it was at one point! 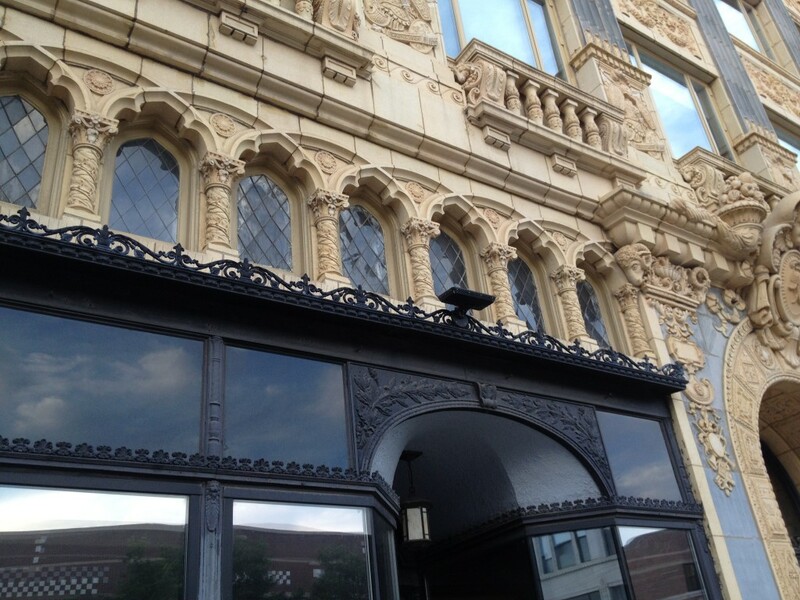 I love Chicago history (and history in general for that matter) and it was fun to see how many of the historical details in the building had been kept intact from it’s heyday. 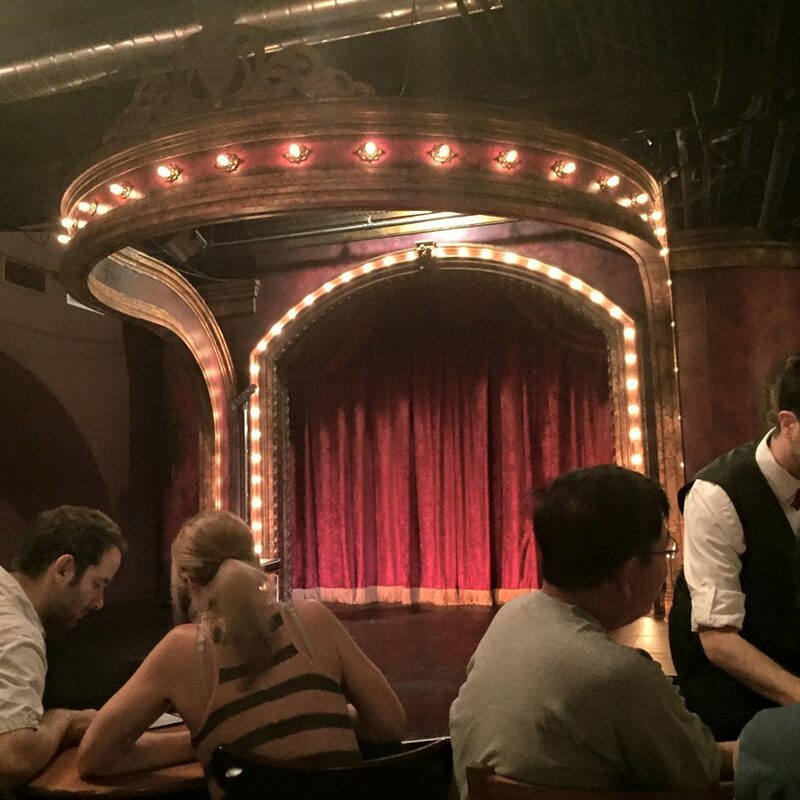 Once inside, the walls are brick, the bar is polished to a woody sheen from generations of elbows, and the cool little stage is lit up to leave you wondering just what fabulous things you are going to witness. There are exposed pipes and vents right next to delicate, pretty chandeliers, and a deceptively large area for seating on two sides of the stage, front and right. The show we were headed to, though, was Chicago Magic Lounge. We found our tickets on Groupon, but they aren’t pricey at all for the regular cover charge of $25. Even without a show, that door fee for this place would be worth it! Our only issue was that there was only one waitress and perhaps 80 people there. It wasn’t that she wasn’t working hard – let me tell you, that girl can hustle! – but she was seriously overworked covering the entire room. The menu is simple; an array of cocktails and bar snacks at $1/scoop, served in cute silver buckets. There’s also a menu of craft liquors, from which Richard chose a craft scotch that he adored. Me? I kept the Mai Tai’s coming! They were strong and well-made, so kudos to the fellow behind the bar. While you are enjoying your cocktails and snacks, the fun begins with close-up table magic. There are several roaming magicians who will stop by to make you laugh and amaze you with some really fun tricks. Some of this is basic stuff; card tricks, disappearing and multiplying foam balls and the like, but some was truly unique. We had one particular magician who came by who truly amazed us. One trick involved me writing my name and the date on a card, him rubberbanding all the cards together after I hid it in the deck and tossing them at the ceiling… where my card stuck, face down so you could see my name right there, in bold sharpie. Stuck to the ceiling. There were more cards across the room, and he invited me to come back and bring friends to see “my” card up there with the rest. 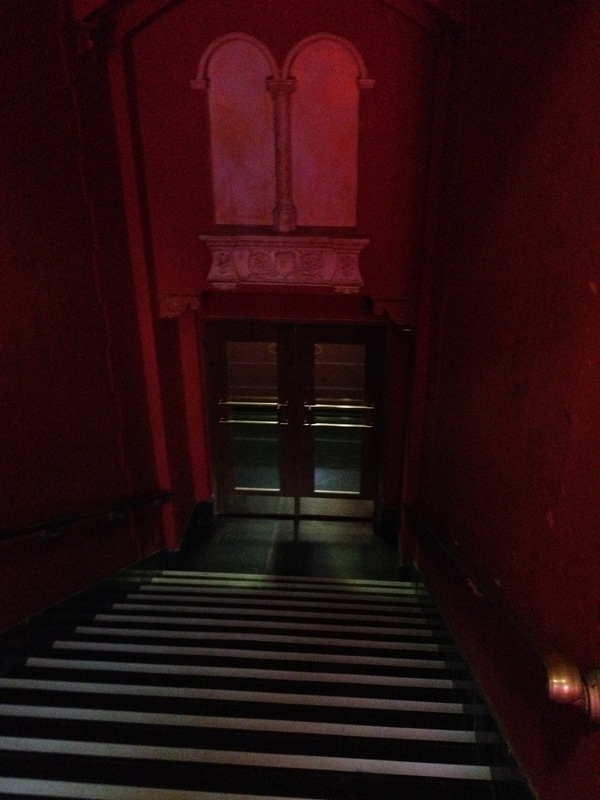 If you go, check out the vent toward the bar to the right of the stage. You’ll see a boldly written “Katie 8/13” up there on a 6 of hearts! We learned later that this magician was one of the founders of the Chicago Magic Lounge and a member of several national magic organizations. Awesome! And how did we learn that? Well, the emcee for the night is another founder – and flipping hilarious as well! Much of our previous magic show experience was from seeing folks like Criss Angel and there is very little comedy in his stuff (srs bznss folks!). This whole show had us laughing – we had such a fun, fabulous time! After the table magic, there were three shorter magic acts, then an intermission, and the headliner. I have to say, we found the headliner a little less entertaining than the opening acts. He did tell us to lower our expectations, but… we thought it’d be a little more in-depth. That said, he was a mentalist rather than a traditional “tricks” magician and that may have been less our thing. One of the other opening magicians was mentalist Chris Jones, who you may know from America’s Got Talent. He was fabulous, funny, and entertaining, and it was awesome to see a familiar face on stage, up close and personal. He nearly got Richard hypnotized, but Rich did not want to go up on stage and fought it a bit. Sorry Mr. Jones! We’re shy folk here at the ranch! Overall, this is a fabulously fun experience. The patter of the emcee is peppered with magic history both in Chicago and throughout the country. We felt like we learned a lot as well as being highly entertained. I’d suggest heading over there for anyone looking for an amazing Thursday night, when anything can happen! It would be a perfect place to have a bachelorette or birthday event, and you might get pulled on stage (and sent home with a bottle of wine for your trouble!). If you are in the Chicago area, or visiting, go! Go! Gooooo!!! Get the Groupon Discount here!